A massive destruction of the Ottoman (Orthodox Christian) Armenian population in 1915−1916 is among the greatest atrocities committed during the WWI and for sure a first 20th century case of the genocide as up to 1.500.000 ethnic Armenians were executed by the Ottoman authorities and their collaborators. As a consequence, the survivors are scattered across the globe. Today it is already a century old event, but the issue of the 1915−1916 Armenian Genocide is undoubtedly still alive and divisive political issue firstly between the Armenians and the Turks but also and among the western “liberal democracies” on the question of their responsibility in the genocide similarly to the question of the western indirect participation in the WWII Jewish holocaust. The Ottoman Empire, as all other empires in the world history, was multiethnic, multiconfessional, multilingual and multicultural state. At the eve of the WWI it was being located at three continents (Asia, Africa and Europe) with approximately two million Christian Armenians who have been living in historical-ethnogeographic Armenia, Istanbul and other towns within the Ottoman Empire. The Ottoman empire committed genocide on the ethnic Christian Armenians, organized and realized a century ago, was one of the most comprehensive examples of ethnic cleansing ever happened and recorded. It started on April 24th, 1915 in the Ottoman capital Istanbul (a Greek Constantinople) and soon was spread over the whole empire when thousands of well-known and well-to-do Armenians were firstly arrested and detained and later tortured and murdered. The organized genocide was over in August 1916 when its second phase happened (March−August 1916) with a massive killings of the Armenians who were at that time deportees in the Syrian Desert, in or around Del el-Zor. It is today estimated that the genocide cost up to 1.500.000 Armenian lives what practically means that after the WWI left only a minority of the pre-war Armenian population (one quarter). In our days, as a direct consequence of the genocide from 1915−1916, for instance, it is very hard to find the Armenians living in the interior of Asia Minor (Anatolia, a word of the Greek origin that means the East). The rapid process of decline of the Ottoman Empire (Sultanate) started with the Serb (1804−1815) national revolution and the Greek War of Independence (1821−1829) against the Ottoman yoke. Prior to the WWI the Ottoman authorities lost almost all their European possessions followed by the establishing of the French, British and Italian protectorates (colonies) in the Ottoman North Africa from 1830 to 1912. What concerns the Armenians within the Ottoman Empire; they had very important economic and financial influence before 1915. The Ottoman government throughout the 19th century and the beginning of the 20th century was allowing to the Armenian financial and industrial elite to develop their businesses. The Armenians became even responsible for the Ottoman state’s mint, having in their hands cannon and shipbuilding industries and above all the Ottoman Armenians dominated trade in the country. Especially the Armenian businesses located in Istanbul were well known in Europe. Such economic prosperity of the Ottoman Armenian higher social strata gave a foundation for the Armenian national-cultural revival in the 19th century and at the beginning of the 20th century. The Armenian economic superiority can be seen the best perhaps from the very fact that there were 32 Armenian bankers out of total 37 throughout the Ottoman Empire. However, the Armenian elite did not possess any political power in the Ottoman Empire for the very common reason and rules as this area of activity was reserved exclusively for the Muslim believers regardless on their ethnolinguistic origin. Nevertheless, the year of 1889 is one of the most important turning points in the history of the Late Ottoman Empire as it was established illegal the Committee of Union and Progress (the CUP) by a group of well-educated civil servants and military cadets with the ultimate political-national goal to stop further declination of the state which could bring the Ottoman Empire to the end of its existence. More immediate goal was to restore the 1878 Constitution which was proclaimed as a consequence of the 1877−1878 Russo-Ottoman War and the 1878 Berlin Congress. The establishers of the CUP were the Young Turks, the Turkish intellectuals imbued by the West European nationalistic theories, of whom majority have been living in Paris where they were spreading propaganda against the Ottoman sultan Abdul Hamid II (1876−1909). The CUP party’s leaders were Mehmed Talaat, Major Ismail Enver Pasha and Dr Bahaeddin Shakir – all three of them later became mostly responsible for the Armenian genocide in 1915−1916. The Ottoman loss of the First Balkan War and as a consequence the loss of almost all Ottoman land possessions in Europe in 1912−1913. The putsch by the Young Turks of January 23rd, 1913 during the First Balkan War. The beginning of the WWI. The First Balkan War started in October 1912 with the war declaration to the Ottoman Empire by Montenegro, Serbia, Greece and Bulgaria (the Balkan Alliance) for the sake to expel the Ottoman state from the Balkans and to share its Balkan possessions between themselves. Regardless to the German help in the improvement of the Ottoman military under the Young Turks the Ottoman army was in general not enough prepared and ill-equipped to successfully fight especially after the exhausting Italo-Ottoman War, 1911−1912 over the province of Libya. The Treaty of London signed between the Balkan Orthodox Christian states and the Ottoman Empire on May 30th, 1913 left to the Ottoman state in Europe only a strip of land around Istanbul and as an aftermath it had a very deep traumatic impact on the Muslim segment of the Ottoman society. After the Balkan Wars of 1912−1913 the Armenians and Greeks became two largest Christian communities in the Ottoman Empire. As both the Orthodox Christians, it was only a question of time when both of them will experience the Muslim Ottoman revenge: the Armenians in 1915−1916 and the Anatolian Greeks in 1922−1923. After the Balkan Wars the Ottoman society, culture and even identity suffered a heavy blow that brought an idea of revenge including and an option of genocide as the most radical instrument of its realization. The CUP’s leadership well understood that after 1913 a project of the Ottoman identity was over as unrealistic and unacceptable by all non-Muslim subjects of the empire. However, the most important impact of the Balkan Wars to the Muslims of the Ottoman society, especially to its ethnic Turkish segment, was the creation of a mental schizophrenia of a “knife in the back” by the Christians of the Ottoman Empire. The CUP’s MPs openly were accusing in the parliament the Ottoman Bulgarians, Greeks and Armenians for the state’s treason during the Balkan Wars. A new putsch by the Young Turks, who never have been elected to power, committed on January 23rd, 1913 was the second factor of the main causes of the 1915−1916 Armenian Genocide. After the 1913 Coup a CUP’s dictatorship (Talaat-Enver) was established (1913−1918) that was followed by the restriction of a free-speech in the Parliament and terrorizing the members of the opposition. The final result of the putsch was a complete concentration of power in the hands of the CUP which started a policy of transformation of the Ottoman multiethnic society into a homogenous national state of the ethnolinguistic Turks. Such policy required either assimilation or extermination of non-ethnic Turkish Ottoman population. In addition, the course of the Armenian genocide was strongly influenced by the internal rivalry within the CUP’s dictatorship between Enver Pasha as the Ottoman military commander and Mehmed Talaat who was the civil leader of the empire. Nevertheless, the beginning of the WWI was the crucial factor of the causes of the Armenian genocide. From the very start of the WWI it was clear which side the Ottoman Empire is going to support as the Ottoman government signed an agreement with Germany on close bilateral cooperation on August 2nd, 1914 including and the issue of mobilization. The Ottoman army’s commander-in-chief Enver Pasha became directly responsible for the start of military operations against the Entente as he ordered to the Ottoman navy to bomb the Russian sea coast on October 29th, 1914 without official proclamation of war. That was reason for the Entente to declare war on the Ottoman Empire. Therefore, the Armenian position became very delicate as the Armenians were living on the very border with Russia and as such they were seen by the Young Turk’s regime as a potential collaborators with the Entente and even as a dangerous “fifth column” in the Ottoman Empire. Subsequently, from September 1914 the CUP’s government started with persecution of the Armenians by different means as, for instance, arbitrary war requisitions, arrests, closing the Armenian-language schools, banning Armenian political-national parties and societies, etc. The Ottoman Empire became officially at war with the Entente on November 11th, 1914. For the Young Turks’ government the Ottoman participation in the WWI was a good opportunity for both recovering the empire and implementation of radical solutions to the acute internal cluster of problems. One of the crucial motifs for the participation in the war was territorial expansion of the empire that was possible only in the East, i.e. at the expense of Russia. However, on the very border with Russia there were the Armenians who were in principle supporting the Russian Empire as a potential liberator of them from the Ottoman yoke. Nevertheless, the Ottoman army suffered heavy losses as a number of the Ottoman invasions finished with catastrophic results. But the crucial point was that Enver Pasha accused exactly the Armenians for these abortive military campaigns as a nation who betrayed the Ottoman national interest. The Turkish propaganda openly accused the Armenians of the Ottoman Empire of state’s treason, calling the Turks and other Muslims to boycott all Armenian businesses and even it was spreading stories about alleged crimes against the Turks committed by the Armenian nationals. As a consequence, Mehmed Talaat Pasha on December 26th, 1914 ordered the resignation of all government’s officers of the Armenian origin and arresting of all who defy these measures. From January 1915, more radical anti-Armenian policy was implemented as the Armenian-language newspapers are shut down and some of prominent Armenians, especially in Istanbul, have been arrested and later murdered. The Armenian genocide was a deliberate action of systematic destructions, executions, dispossessions, deportations, forced assimilation, induced famine, ethnic cleansing and annihilation of material signs of the Armenian culture and national existence on the territory of the Ottoman Empire. 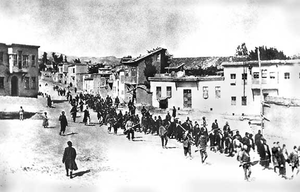 Originally, the genocide started with the massive killings of the economic, religious, political and intellectual elite of the Armenian society in Istanbul on April 24th, 1915, but it soon became a pattern for whole-range genocide on all segments of the Ottoman Armenian national elite throughout the empire who were arrested, imprisoned, terrorized and ultimately exterminated. The entire higher social and national strata of the Armenians became eliminated during only several weeks up to June 1915. The executions of the Armenian dignitaries have been organized even on the public squares of the towns according to preserved documentary material (photos) in Armenian National Institute and Armenian Genocide Museum Institute in Yerevan. To make an impression that the Armenians as a nation never existed on certain territories. To ensure that the Armenian survivors will never return back to their original places of living. 1) The Jewish holocaust during the WWII committed by the Nazi Germany’s NSDAP regime in occupied Europe. 2) The Serb holocaust on the territory of the Independent State of Croatia, 1941−1945 committed by the Ustashi Croat regime. See, for instance [Th. De Vaal, Great Catastrophe: Armenians and Turks in the Shadow of Genocide, New York−Oxford: Oxford University Press, 2015]. See, for instance [P. Balakian, The Burning Tigris: The Armenian Genocide and America’s Response, New York: HarperCollins Publishers, 2004]. R. Kévorkian, The Armenian Genocide: A Complete History, London−New York, I.B.Tauris, 2011. On the origins of genocide, see [A. Jones, Genocide: A Comprehensive Introduction, London−New York, Routledge Taylor & Frances Group, 2006, 3−38]. On the legal definition of genocide and human rights in international law, see [W. A. Schabas, Genocide in International Law, Cambridge−New York, 2003; C. de Thain, E. Shorts, International Criminal Law and Human Rights, London: Sweet & Maxwell, 2003; A. Vincent, The Politics of Human Rights, Oxford−New York, Oxford University Press, 2010]. On the 1948 UN Convention on the Prevention and Punishment of the Crime of Genocide, see [A. Jones, Genocide: A Comprehensive Introduction, London−New York, Routledge Taylor & Frances Group, 2006, 12−14]. For instance, on historical-ideological background of the Serb genocide in the Independent State of Croatia, 1941−1945, see [В. Ђ. Крестић, Геноцидом до велике Хрватске, Јагодина: Гамбит, 2002]. According to this research study, the genocide was ideologically inspired by a concept of a Roman Catholic Croat based pure Greater Croatia supported by Vatican and Austria-Hungary. On this issue, see more in [R. Panossian, The Armenians: From Kings and Priests to Merchants and Commissars, London, 2006]. In Turkish: Ittihad ve Terakki Cemiyeti. D. Kushner, The Rise of Turkish Nationalism, 1876−1908, London, 1977. About the origins of the Armenian genocide, see more in [R. Melson, Revolution and Genocide: On the Origins of the Armenian Genocide and the Holocaust, Chicago−London: The University of Chicago Press, 1996]. Similarly, after the WWI Adolf Hitler was accusing the German communists and social democrats for the state’s treachery in 1918 that finally led Germany to the lost war. A. Taner, “The Chilingirian Murder: A Case Study from the 1915 Roundup of Armenian intellectuals”, Holocaust and Genocide Studies, 25 (1), 2011, 127−144. In Turkish: Emval-i Metruke Komisyonu. On this issue, see very valuable source [A. Sarafian, Talaat Pasha’s Report on the Armenian Genocide, 1917, Gomidas Inst, 2011]. On the German sources on the Armenian genocide, see [W. Gust (ed. ), The Armenian Genocide: Evidence from the German Foreign Office Archives, 1915−1916, Berghahn Books, 2013]. About the German responsibility in the Armenian genocide, see [V. N. Dadrian, German Responsibility in the Armenian Genocide: A Review of the Historical Evidence of German Complicity, Blue Crane Books, 1996]. On deportation of the Armenians from Erzurum exists a telegram message sent by the US ambassador Morgenthau on July 31st, 1915. On the memories of survivors, see, for instance [K. Panian, Goodbye Antoura: A Memoir of the Armenian Genocide, Stanford: Stanford University Press, 2015]. On “devshirme” at the Balkans, see for instance in [И. Андрић, На Дрини ћуприја, Београд: Књига-Комерц, 1997]. On the post-Cold War concept of the “Clash of Civilizations”, see [S. P. Huntington, The Clash of Civilizations and the Remaking of World Order, London: The Free Press, 2002]. A. Jones, Genocide: A Comprehensive Introduction, London−New York, Routledge Taylor & Frances Group, 2006, 107. B. Robert, The Destruction of Memory: Architecture at War, London, 2006, 25−60. As an example of the evidences, a British historian Arnold J. Toynbee wrote a book on the case of the Ottoman Armenian genocide already in 1915 that is a peeonier book on this issue [A. J. Toynbee, Armenian Atrocities: The Murder of a Nation, London: Hodder and Stoughton, 1915]. See, for instance, more historical sources on the Armenian genocide in [H. Morgenthau, Ambassador Morgenthaus Story. A Personal Account of the Armenian Genocide, Cosimo Classics, 2007; G. Balakian, Armenian Golgotha: A Memoir of the Armenian Genocide, 1915−1918, New York: Vintage Books, 2009]. On the Armenian Genocide Trials in Istanbul, see [V. N. Dadrian, T. Akcam, Judgement at Istanbul: The Armenian Genocide Trials, Berghahn Books, 2011]. On documented the Young Turks’ government’s crimes against humanity, primarily on the Armenians, see in [T. Akcam, The Young Turks’ Crime Against Humanity: The Armenian Genocide and Ethnic Cleansing in the Ottoman Empire, Princeton: Princeton University Press, 2013; R. G. Suny, A History of the Armenian Genocide, Princeton: Princeton University Press, 2015; W. C. Marris, First Jihad?! First Genocide?! A Centennial Re-Introduction to the Armenian Holocaust of 1915, Oconomowoc, WI: Circuit Rider Ministries Inc., 2015]. G. J. Bass, Stay the Hand of Vengeance: The Politics of War Crimes Tribunals, Princeton, NJ: Princeton University Press, 2000, 127. G. Robertson, An Inconvenient Genocide: Who Now Remembers the Armenians?, Biteback Publishing, 2014. On extended readings on the Armenian genocide, see [A. Whitehorn, The Armenian Genocide: The Essencial Reference Guide, ABC-Clio, 2015].